If you are looking for better derby performance, then statements such as these are quite intriguing, especially when accompanied by a graph comparing the coefficient of friction of each substance (see Figure 1). Figure 1 – Lubricant Comparison from BryCoat, Inc. When viewing statements and graphs such as these, it pays to take a careful look at the details. In Figure 1, the range of the data is between one and three hundred thousand PSI. This is an extremely high pressure condition. Most importantly, note how the coefficient of friction of the three materials appears to be the same at the low end of the data. An important question to ask oneself at this point is, “What happens as the pressure reduces further, especially at a pressure that would occur in a pinewood derby car?” Clearly, for MoS2 or TS2 (or any other lube for that matter) to be of value, it must have a lower coefficient of friction than graphite at the pressure found in pinewood derby cars. So, let’s test these lubes in that pressure range. Where F is the force required to move the object, µ is the coefficient of friction, and M is the mass (weight) of the object1. As an example, if you were to push a heavy box on a rough road (asphalt) and then on smooth sidewalk, pushing it on the sidewalk will be easier because the µ of the sidewalk is lower. If you then pour oil on either surface, it will be easier to slide the box because the oil has lowered the µ. The main piece of equipment for the experiment is a tilting apparatus (Figure 2). It consists of a piece of glass on a tilting frame, which is moved when the crank winds the string around a rod. An angle measuring device shows the current tilt angle. The sliding blocks are also critical components. Eight blocks of Delrin3 were machined to the same dimensions, and provided with two smooth surfaces. Delrin is not as consistent in density as some other plastics, so there was a slight weight variance between the blocks. So, the lightest block was found, and then small holes were drilled in the sides of the other seven blocks until all of the blocks weighed the same. The resulting weight of each block was 2.05 ounces. This is the typical load for one of the rear wheels on a pinewood derby car. 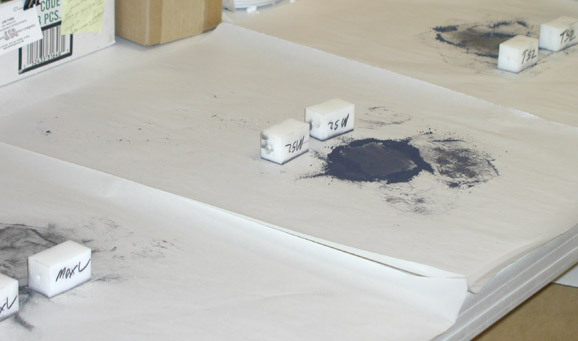 Three lubes were tested: TS2, MoS2, and Max-V-Lube Graphite. Two blocks were used for each lube, and the last two blocks were used without lube as a control. The glass plate on the tilting apparatus was first cleaned thoroughly with a glass cleaner. This cleaning was repeated each time the lubricant was changed. A quantity of each lubricant was placed on a sheet of clean newsprint. One side of a block was then rubbed on the lubricant until thoroughly coated (Figure 3). The block was then placed on the glass and slid back and forth to distribute some of the lube onto the glass. The block was then recoated with the lube and placed on the uphill side of the glass. The glass was then slowly tilted until the block slid to the downhill side of the glass. The tilt angle was then recorded. This test was repeated five times for each block. After all of the tests, the high and low angle measurements were removed and the remaining three were averaged. µ was then calculated for each of the lubricants and for the control test. The results are shown in Figure 4. As shown by the data, both MoS2 and TS2 have a higher coefficient of friction than Max-V-Lube graphite at 2.0 ounces.4 Thus, these lubricants will be less effective than graphite as a pinewood derby lubricant. 1Oftentimes, F(normal) is used instead of M in the equation. These are essentially the same. 2If you are interested in why this is true, there are several good discussions of this on the Internet. 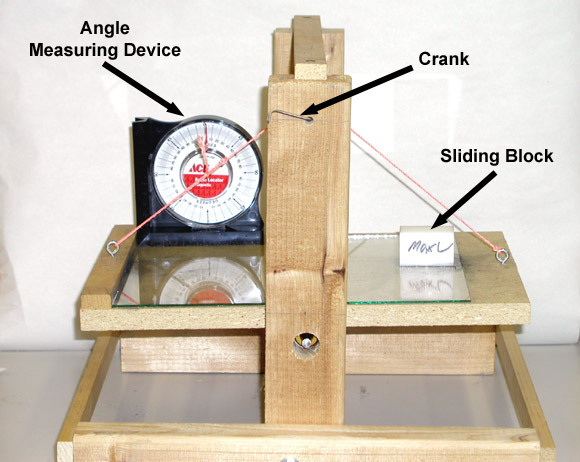 Just search for “measure friction angle” on Google. 3A brand name of an engineered plastic. 4In a previous test using this apparatus, I compared many of the top graphite brands with MoS2 and TS2. In all cases, graphite had a lower µ than MoS2 or TS2. At that time I also tested “Dry White” Teflon lube. Not surprisingly, the µ of “Dry White” was higher than MoS2 or TS2. Note also that spin tests were performed on all of these lubes with compatible results. 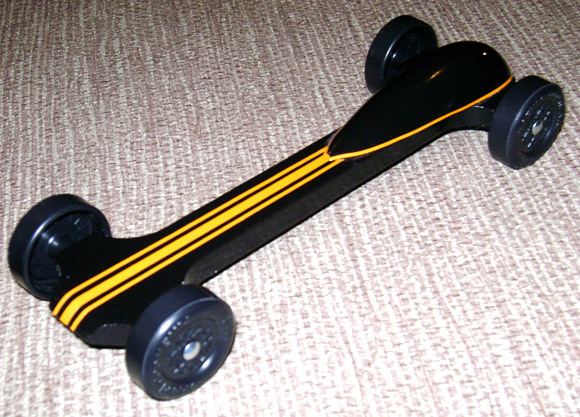 This car was one my son and I built, slightly modifying the Detonator design. The only rules for this particular derby were to use the wheels and block supplied with the BSA kit and not exceed five ounces. So we extended the wheel base and rear weighted with tungsten to achieve a COG at 3/4 inch. We cut down and used a dome to cover the rear cylinder weights, and molded the sides and rear of the car to conform to the outside edges of the dome. We painted the inside of the dome black and then used epoxy to fill in the gaps between the dome and the car body, then finishing it with a fine pin stripping around the dome. The car took first in class, second overall in the pack race, and took first in class at districts. We also received the Best and Fastest looking car awards at both the Pack and District event. My son enjoyed helping with this car which was created for an adult race. We used Tannin’s army men, and cut the bases off the feet then used heat to allow us to bend their legs and arms. The rocks are Styrofoam, and the large rock which holds the base of the flag pole hides the weight. The flag is a miniature fabric flag that was starched to hold the shape. 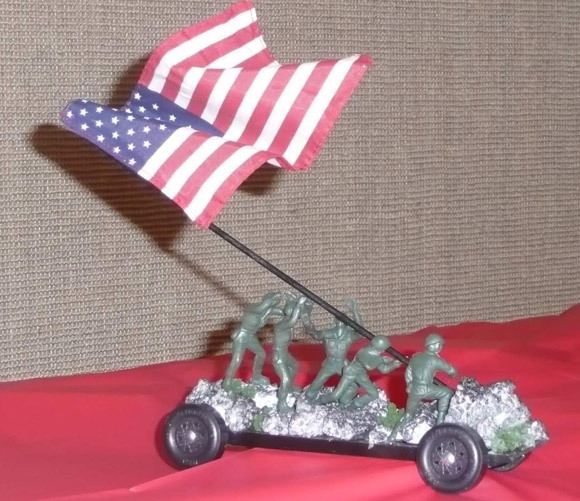 Due to the height, the flag was just for display and not in place during the race. My son just entered his first pinewood derby. At the night of the weigh- in, I overheard one of the leaders talking with another parent as they were looking at a car submitted by another scout. The leader was saying to the parent that the car was from the same boy who had won the previous two years, and that his father is an engineer. After leaving I told my wife about the conversation I overheard. We both got a good laugh because I am an engineer as well. On the day of the race my son ended up winning the overall championship. After the race, I wet up to the leader and laughingly told him that I had overheard the conversation at the weigh-in, and that I too was an engineer. He laughingly responded with, “Son’s of engineers have an unfair advantage”. Editor’s Note: Son’s of engineers don’t have an unfair advantage. The boys in this story were just fortunate enough to have a dad that was willing to work with them and apply the principles that are readily available on the Internet. I was wondering if you have experimented with other lubes like Tungsten Disulfide? I have read about the nano lubricants that are being developed. Have you tried any of those? The results for Tungsten Disulfide are shown in the feature article. I have also tried a nano product known as “Bucky Balls” (technically C60, a member of the Fullerene family). Basically, these are carbon molecules in the shape of tiny spheres. Unfortunately, they don’t behave like ball bearings; instead the product lubricates similar to sand. Which is more important: properly weight balanced car or a car with special designed axles? Really, all the factors are important. But I believe that getting the car to 5 ounces and having the balance point set for the type of track would be more important than a specific type of axle. Of course, you still want to have your axles defect free, and polished.